A month in South America! What a way to spend a summer! Four weeks spent exploring the country of Ecuador: its infamous Galapagos archipelago, the stunning Cotopaxi National Park, the dense rainforest and the bustling and unique culture. Firstly Quito: a long, thin stretch of capital city filled with South American markets and spectacular views of the mountains surrounding it. Then on to the Galapagos Islands to witness some of the most weird and wonderful wildlife this planet has to offer. All manner of creatures populate the islands. Everything anyone could imagine: sea lions covering the beaches, marine iguanas basking in the sun, and blue-footed boobys, penguins and frigatebirds being just some of the flamboyant birds to be found. However, nothing can match the infamous Galapagos giant tortoises that populate almost every island. In the Galapagos, not only is the wildlife something to behold, the archipelago has some fascinating history: from pirates who first took refuge on the islands, all the way to the voyages of Charles Darwin himself and the conservation efforts in the past few decades. As you explore the islands those efforts are plain. The tortoise population is gradually increasing and wildlife across the archipelago are benefitting profusely from the phenomenal effort. But, we could not remain in the Galapagos forever, as amazing as it is. So, inspired by the fantastic work undertaken by the people on the islands, we decided to give something back to the community ourselves and spent the next week helping a local village by decorating and brightening up their football pitch and laying the floor for a new building. They were ever gracious, thankful for the manpower and resources we provided to help further their community. After the week of work, and spending a weekend exploring the markets of Otavalo, we made our way to the Cotopaxi National Park. Despite chilling winds and freezing temperatures overnight, we trekked throughout the park, making our way from camp to camp taking in the magnificent scenery before us. Near the end of the week, we came upon the volcano itself, Cotopaxi, and its slight smaller neighbour, Ruminahui, and the last few days were spent climbing both. On the former, we reached the tip of the glacier, touching the glacial ice that formed the summit. 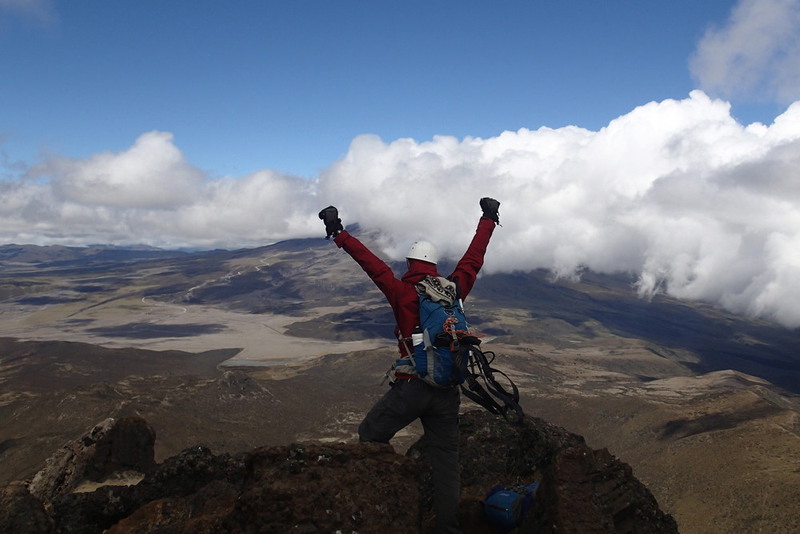 On Ruminahui, we reached the summit breaching the 4800 metre mark - the highest most of us had ever climbed. Nearing the end of our trip, we moved to the final phase, exploring the dense jungle and admiring the flora and fauna. Not only were we astounded by the facts thrown at us of the uses and history of the diverse wildlife, we were intrigued with the culture of a traditional Amazonian tribe we visited and were welcomed by. All in all, the expedition was a truly a once-in-a-lifetime experience which none of us will ever forget - taking home fond memories of the people, wildlife and sights; and a lingering taste of the interestingly flavoursome guinea pig!